Father and son David and Robin Booth, who last year narrowly failed to pick up their fifth consecutive title at the early season highlight, made amends at the latest renewal when winning both show classes, before seeing their gimmer hogg tapped out as champion by judge, Frank Kitching, of Threshfield, while their shearling ewe achieved the day’s top call, which was the highest price at the fixture for some considerable time. Robin Booth is pictured with the family’s Skipton Blue Faced Leicester gimmer hogg show champion. The Booths’ Smearsett J58 gimmer hogg is by the Riddings H3 tup purchased as a ram lamb last year from the Porter family in Reeth, out of a full sister to the Booths’ renowned crossing sire D15, who has performed well on the Smearsett flock for the past six breeding seasons. The victor sold for £1,200 to Geoff Richmond, of Goosnargh, Preston. D15 was also responsible for the Booths’ red rosette-winning Smearsett H42 shearling, which is out of a A1 Hundith-sired ewe and has been scanned carrying twins to their £11,000 Midlock J2 tup. The top price performer joined Ellis Bros at Cragg House Farm, Addingham Moorside, and has taken its place on their 35-strong Blue Faced Leicester flock. The farm is run by Richard Ellis, his brother Simon and their sons Dan and Robert. 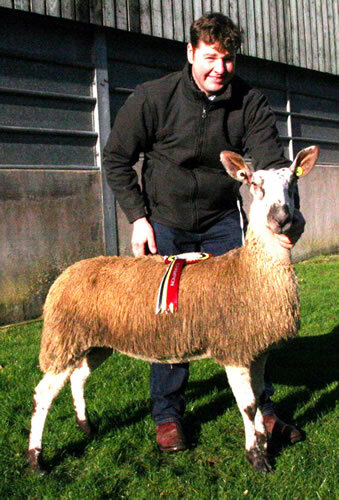 It was an about turn on the 2016 result, when defending champions John and Claire Mason, who run the Oddacres BFL flock in Embsay, had this year to settle for reserve honours with their second prize gimmer hogg, Oddacres J29, who is also a product of Booth breeding, with the sire, Smearsett G27, purchased last year for £4,300. So too is the dam, a daughter of E1 Low Tipalt, bred in Cumbria by Ron and Fran Wilson, who is himself by the Smearsett Black Tag ram. The overall runner-up sold for £300 to the show judge. The Masons also stepped up with the third prize gimmer hogg, Oddacres J26, by the Skipton-bought Micklaw G1 tup, bred by Kirkby Malham’s Will Wildman, out of an E4 Low Tipalt-sired ewe. This one returned to Mr Wildman for £180. Back with in-lamb show entries, the third prize winner came from a dispersal sale of part of the adult section of Alan Robinson’s Cowside flock in Settle. His 2 crop ewe, due at the end of March to Sutcliffe, returned to North Craven when becoming a £150 acquisition by Stainforth’s RL Handy. The 13 BFL females on parade saw gimmer hoggs sell to an overall average of £560 per head, well up on the previous year’s £457, while in-lamb ewes and shearlings averaged £413. The show formed part of Skipton’s second fortnightly Wednesday sheep sale of 2017, which attracted a larger entry of 1,217 store lambs, though quality was very mixed, with lambs generally smaller than the previous sale. However, anything with strength and type was well bid for, while long keep lambs were keenly sought, with feeder finishers reporting a good supply of winter forage that needs eating. The Masons returned to the fray to head the store lamb prices with pens of Mule lambs sold at £88 and £78 per head, with a section average of £43.51. Texel averaged £54.17, Beltex £52.16, Suffolk £44.74 and Swaledale £30.63. Skipton’s next fortnightly Wednesday store lamb fixture on February 8 features a special sale of in-lamb ewes, including the entire flock dispersal of 375 New Zealand-type Texel ewes and gimmer hoggs, and Texel-cross and Mule ewes, from Rowntree Farms, Gisburn, along with another in-lamb Beltex packet from Ian Lancaster, of Wiswell, Clitheroe.